The Saint Mary’s College High School Thailand immersion group. 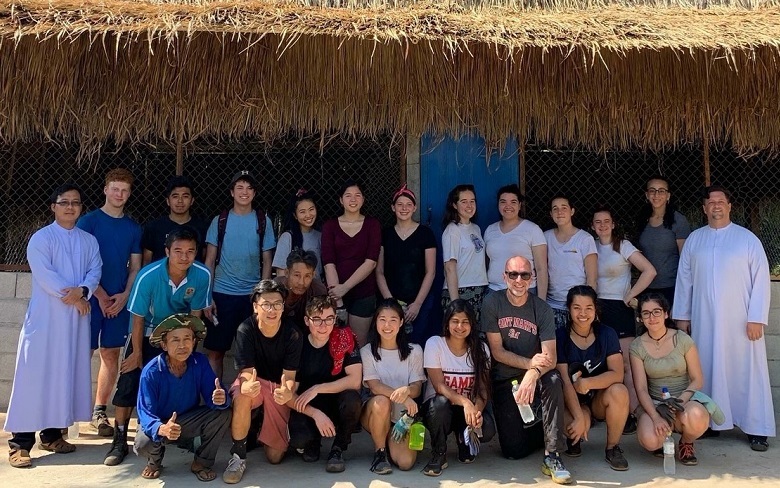 In early March, a group of students and adults from Saint Mary’s College High School in Berkeley, CA visited and volunteered at the La Salle Bamboo School in Sangkhlaburi, Thailand. The service immersion trip was part of Saint Mary’s annual Enrichment Week. The Bamboo School, along with the Parmenie Learning Center, provides education for approximately 400 Burmese refugee children on the border of Myanmar and Thailand. They and their families have been displaced from Myanmar due to an ongoing civil war and forced to create and live in makeshift villages along the border. The Saint Mary’s delegation was made up of 16 students and faculty members Azure’D Nunley, Greg Kelly, and Brother David Caretti, FSC. According to Brother David, the idea for the trip was sparked by the travels of Brother James Joost, FSC, Auxiliary Visitor for the San Francisco New Orleans District. At work building the chicken coop. The Saint Mary’s students’ involvement with the Bamboo School actually began earlier in the school year. Knowing that they would be helping to build a chicken house there, they prepared for their trip by learning basic construction skills and practicing them in an area on campus. Once at La Salle Bamboo, the group worked in the heat and humidity (March is the start of the hot season in Thailand) to complete the construction project. It was valuable and rewarding work, with the group even getting to witness almost immediately the benefits of the newly-built coop. 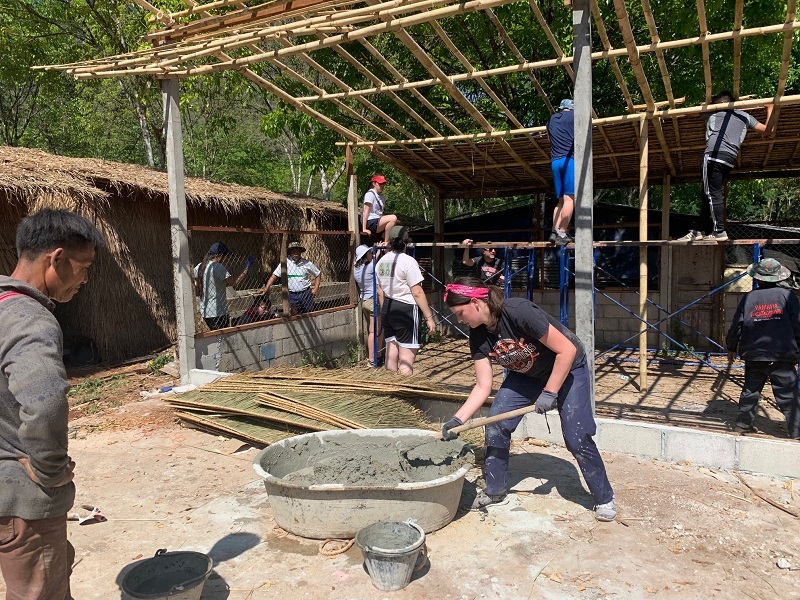 While at the school, the Saint Mary’s students also taught conversational English, did gardening, helped with minor repairs to Bamboo students’ homes, and made many new friends along the way. Saint Mary’s and Bamboo School students together in class. Before returning home, the travelers also had the chance to tour Bangkok’s Grand Palace and Wat Pra Keaw, Reclining Buddha, Temple of Dawn, and famous floating market. Each year during Saint Mary’s Enrichment Week, every student chooses a learning experience that is of particular interest and in which the student participates throughout the week following Christmas break. The curriculum for Enrichment Week is developed by the faculty and contains a mix of academic, travel, career exploration, and recreational classes. 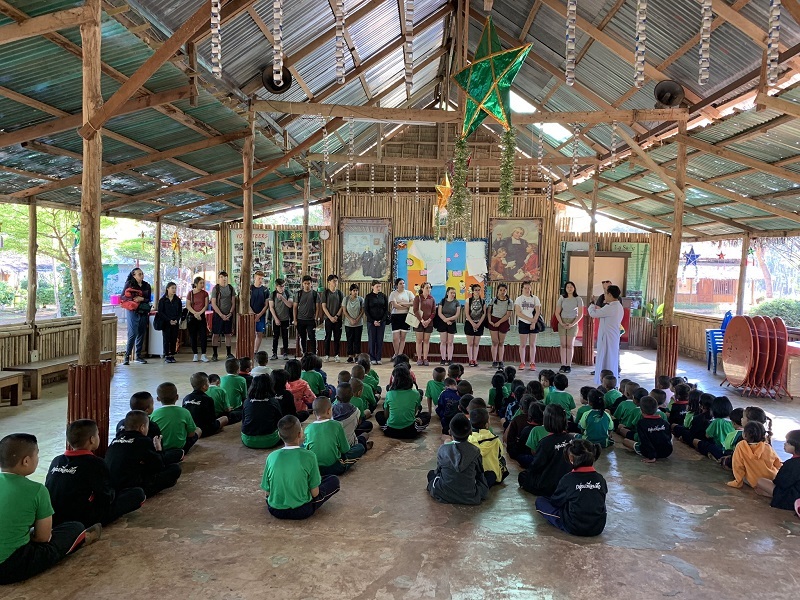 In the case of the Saint Mary’s immersion trip to La Salle Bamboo, the most important lesson for the students and faculty members may have been their experience of the span and impact the of the Lasallian mission to which they all belong. All photos courtesy Saint Mary’s College High School.